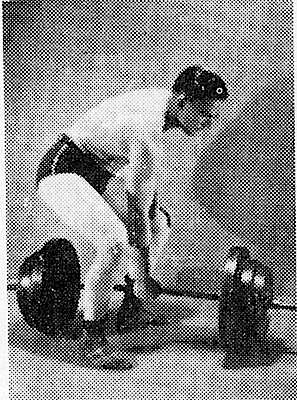 "Muscle Building Exercises - 3 Key Exercises for Muscle Building from the 1930s"
Searching for the top muscle building exercises? The strongmen of the 1930s hold the key! It seems the strongmen of yesteryear knew a thing or two about muscle building, with tales of trainees commonly gaining 20 lbs in less than a month becoming legendary. What exercises did they use? Can YOU do the same? To discover the best strength training exercises we must turn a reverential eye to the past. Our story begins with a 128 lbs and 5' 10" Peary Rader. Despite 12 years' strength training in an attempt to develop his physique, a frustrated Rader hears of the astounding muscular gains made by J.C. Hise and decides to contact him. Heavy breathing squats + wholesome food + milk + rest = incredible growth in muscular size and strength. And since Hise ALSO trained outdoors using a squat rack made from tree limbs braced against the wall of a shed, he proved the simplest strength training equipment - if used effectively - can produce startling results. 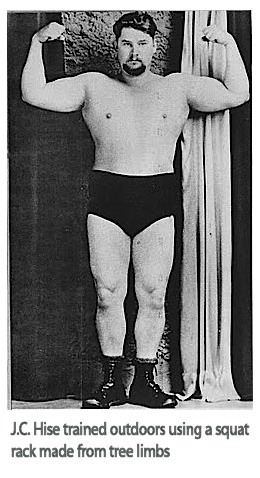 Despite Rader's previous poor gains, the later founder of IronMan Magazine added 10 lbs of good muscle in the first month. In two years Rader went onto gain 70 lbs of bodyweight, and would later become the heavy weight lifting champion of the Midwestern AAU district, including South Dakota, Nebraska and western Iowa. What can we learn from these strongmen of yesteryear? Simply, that the best exercises for muscle building - correctly utilized - yield terrific results. Moreover, an effective strength training routine should include exercises which stimulate maximum growth in ALL the major skeletal muscles in the minimum time. 1. The deadlift or Olympic clean and jerk. The deadlift exercise is a supreme growth exercise as it works every muscle on the backside of the body, including the deltoids, the forearms, and just about every other muscle. 2. Close-grip pulldown or chin up. The chin up exercise will not only work the latissimus muscles on the back, the deltoids and forearms; but is the most effective exercise to build bigger biceps. 3. Parallel bar dip. The dip exercise will do for your upper body what the squat exercise will do for your whole body. This proven muscle builder works the pecs, deltoids, traps and triceps. The strongmen of the 1930s knew a thing or two about muscle building. Moreover, they knew which muscle building exercises yield the best results - these same exercises can do the same for you.